please make sure to scroll all the way down ~ thanks! I made these from vintage toy blocks with a tiny jointed bear on top. 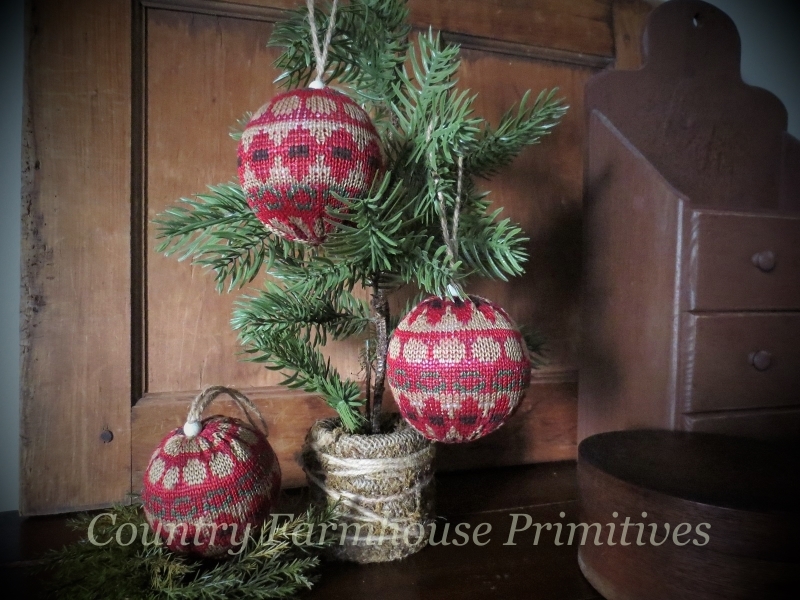 You will get a set of 3 ornaments in assorted old blocks. Measures approx. 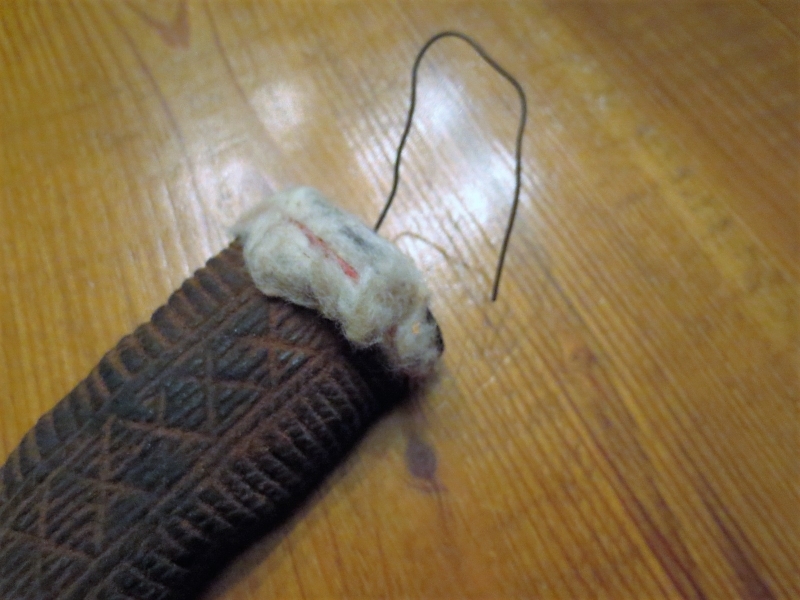 3.5'' tall and has a gold cord hanger. 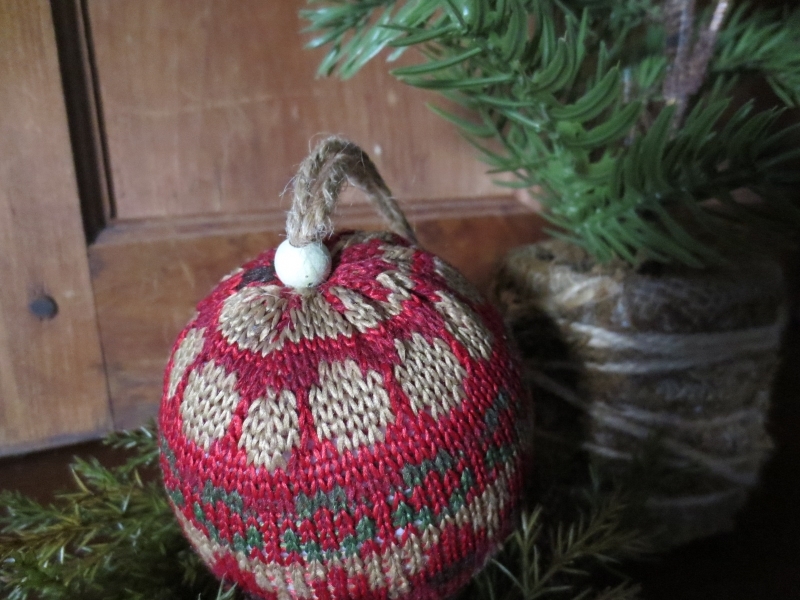 Made by Old Mother Hubbards, this primitive snowman head can be used as a bowl filler or tree ornament with attached wire hanger. 6'' wide & high. USA. 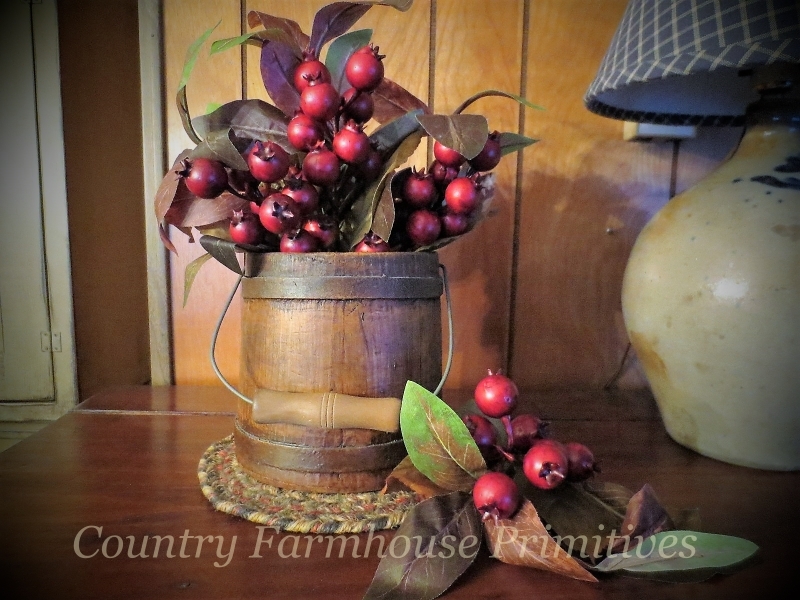 I've put together some vintage play blocks on a wooden base and added a bottle brush tree. 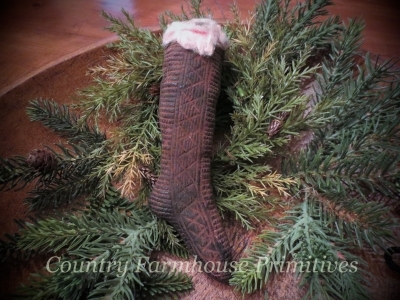 Great for display with your Santas! 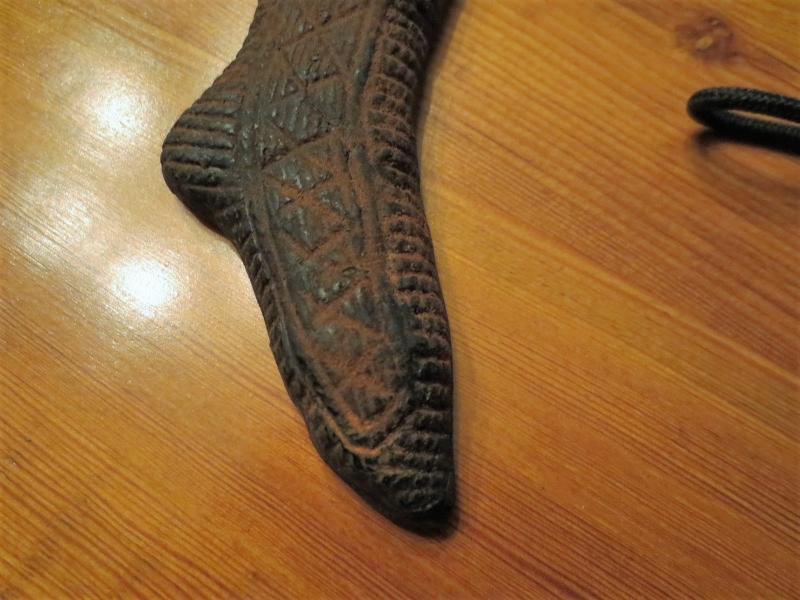 About 10.5'' long & 4'' high. USA. 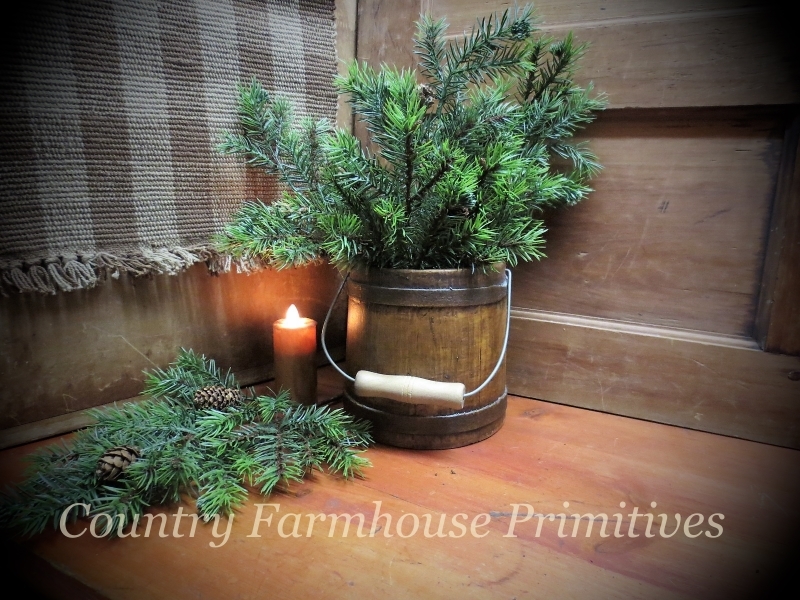 These faux pine branches are so easy to display with ... artificial greenery doesn't dry out and shed :-). 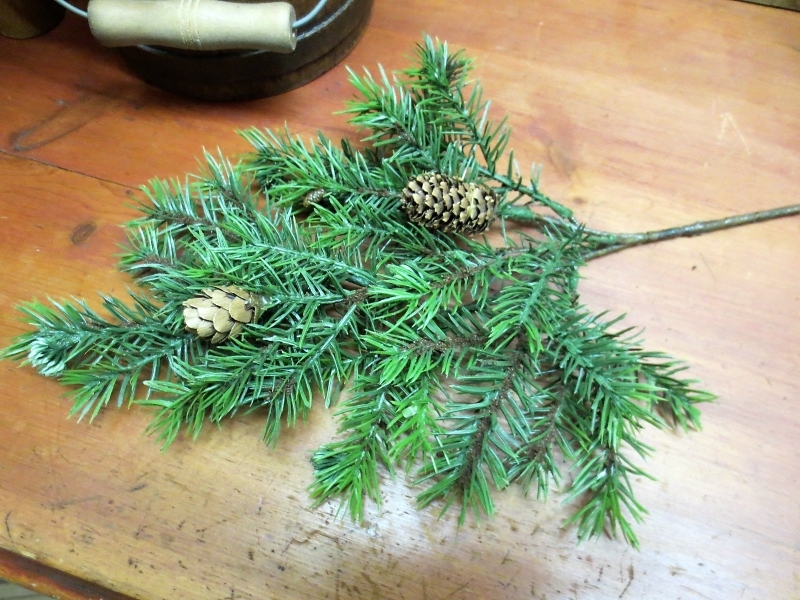 Multi branched pine with cones ~ 16'' long. 3 shown in bucket. 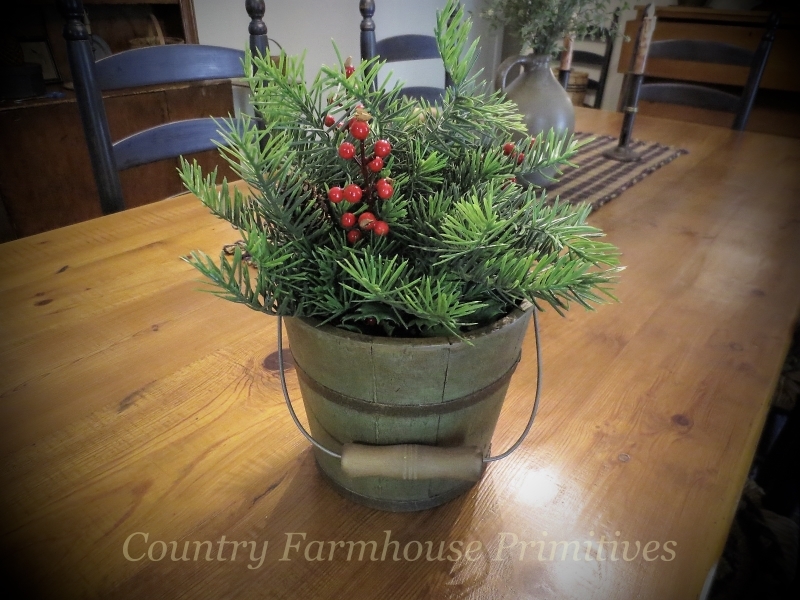 Great for filling buckets or placing in displays. 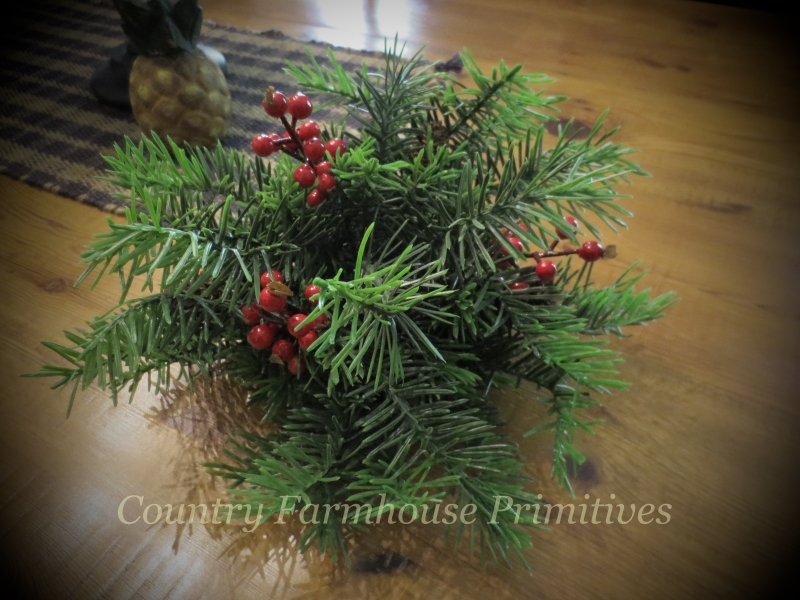 Mixed pine with cones and red berries. Choose from the 13'' or 17'' sizes. 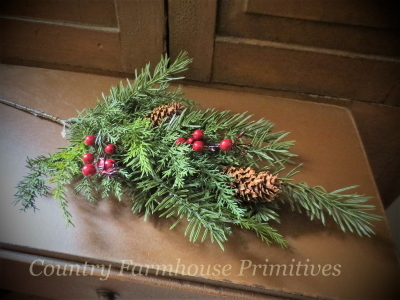 Use as a candle ring or small cupboard wreath ... very pretty and wispy. 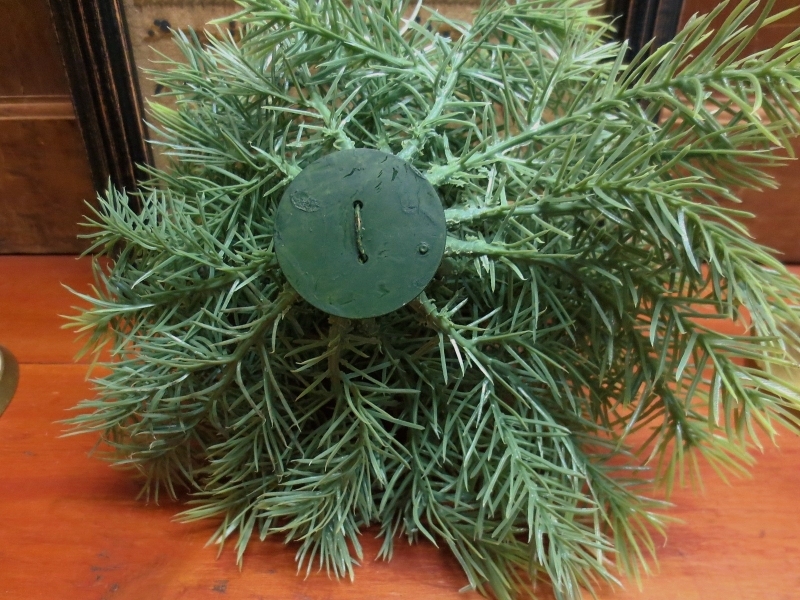 Measures about 12'' around with a 4.5'' inner diameter. 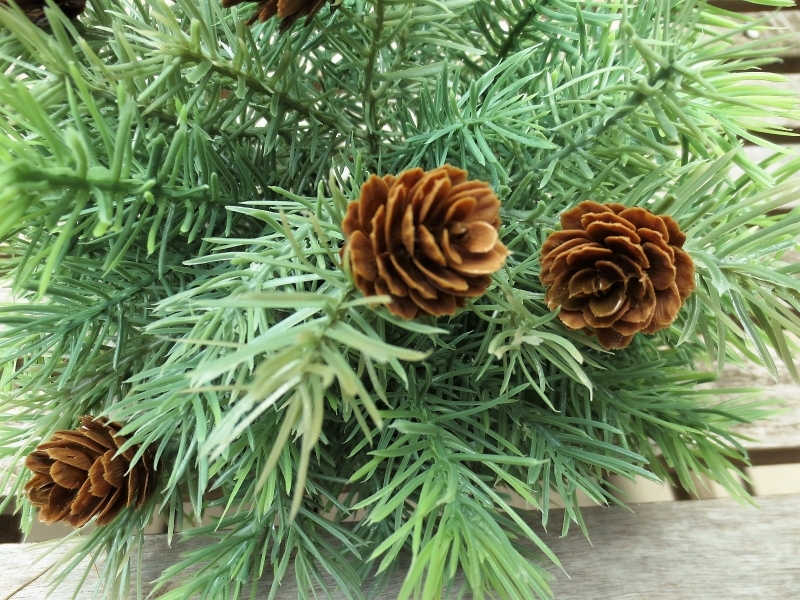 Dried cedar tips and medium sized pine cones have been left unscented ... feel free to add scent or leave simple. Perfect in bowls for winter decorating. Bag of 4+ Cups! 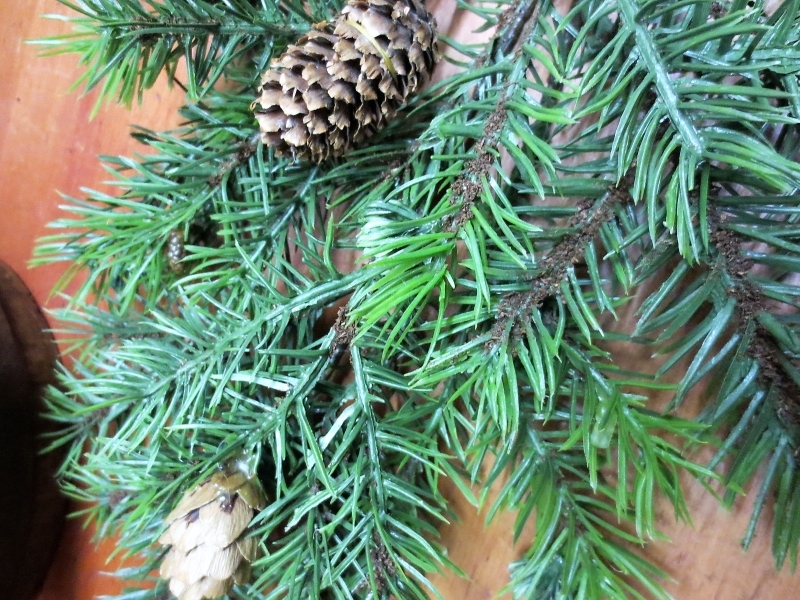 Amazing smelling fragrance oil ... "Winter Wilderness" is a fabulous scent that combines balsam, pines, and a bit of spice. .5 fl. oz ... a little goes a long way. Refresh your potpourri. Artificial pine with red berries shaped into a half sphere. 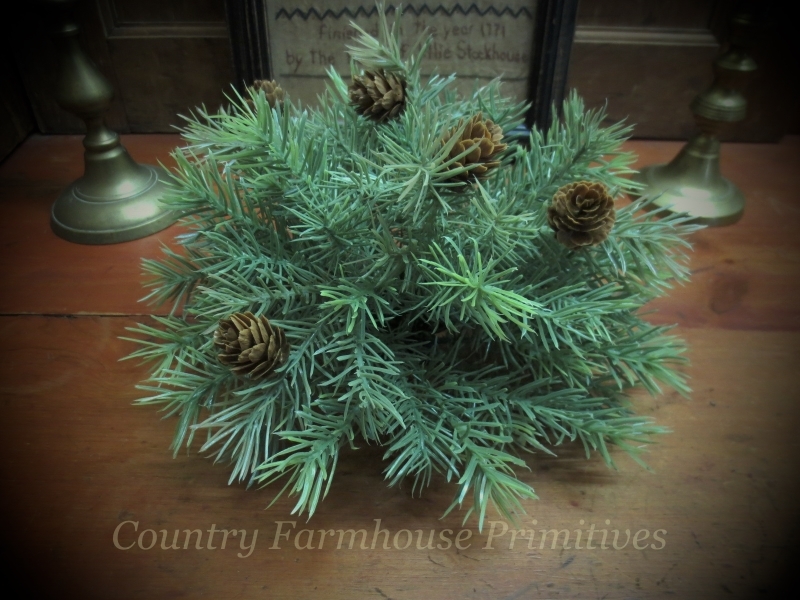 These are great for dropping into small crocks, baskets, etc ... or use alone on table scapes. 11'' wide x 6'' tall. 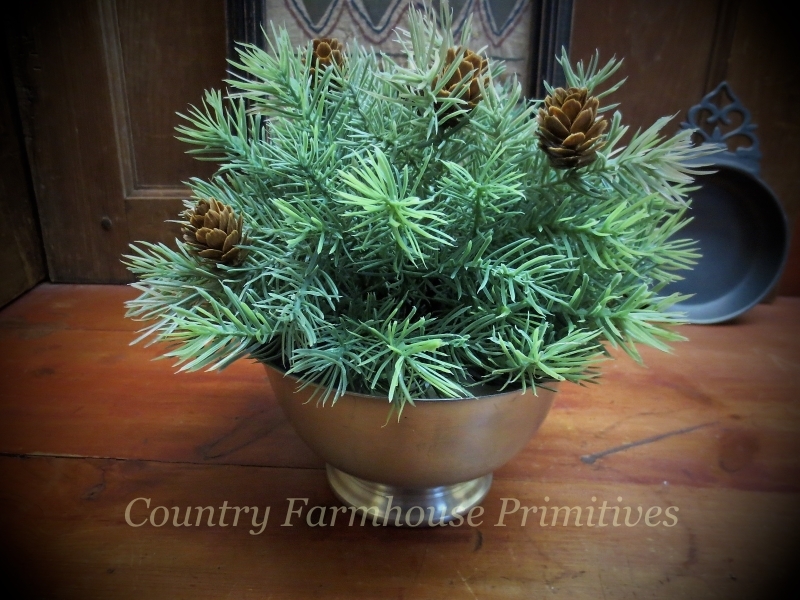 Artificial soft pine with cones shaped into a half sphere. 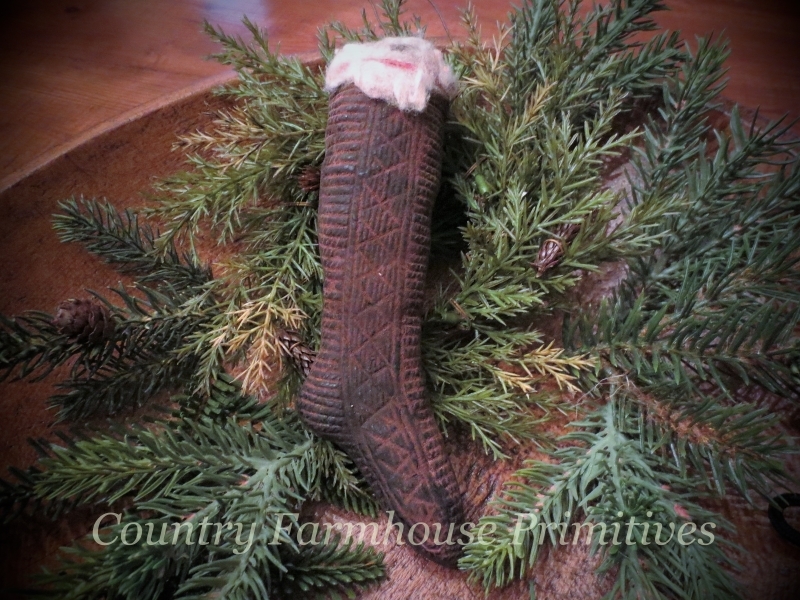 These are great for dropping into small crocks, baskets, etc ... or use alone on table scapes. 10'' wide x 6'' tall. A cute ornament for your tree or cupboard door. 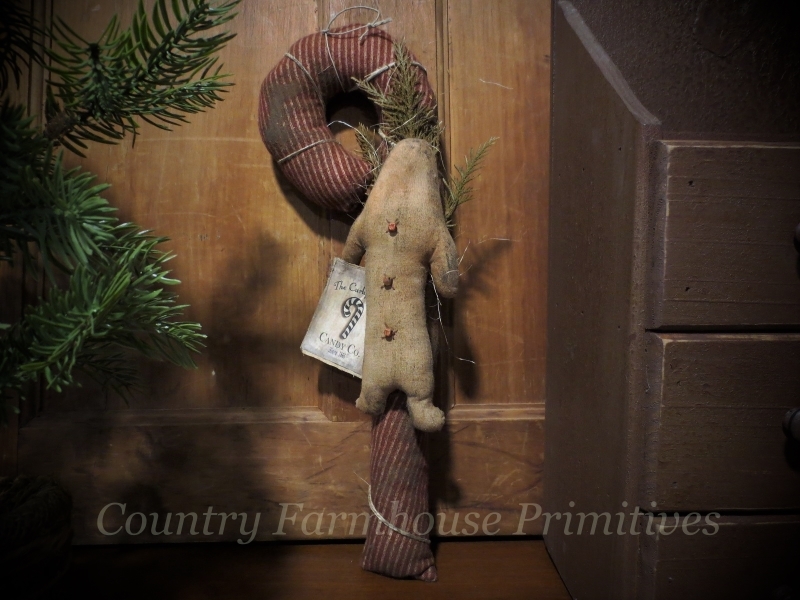 Stuffed and stitched with a prim feather tree, this wool mitten has sprigs of greenery and a grungy miniature bear. ​A grungy flannel stripe candy cane with prim gingerbread man, greenery and a hang tag. 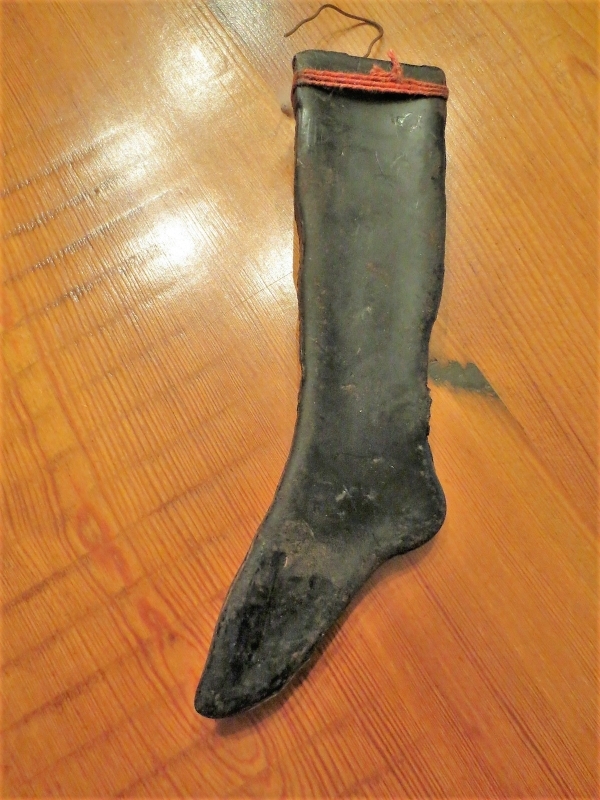 Measures about 14'' long. Looks good hanging on a peg rack ... Very primitive! 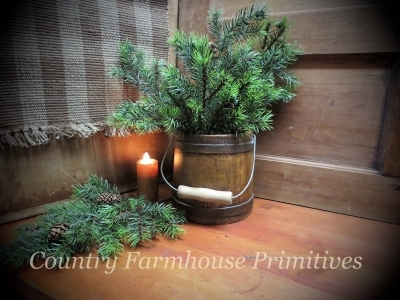 ​Use these electric twig lights in jugs, crocks & baskets. 40 soft white mini lights on artificial pine branches. 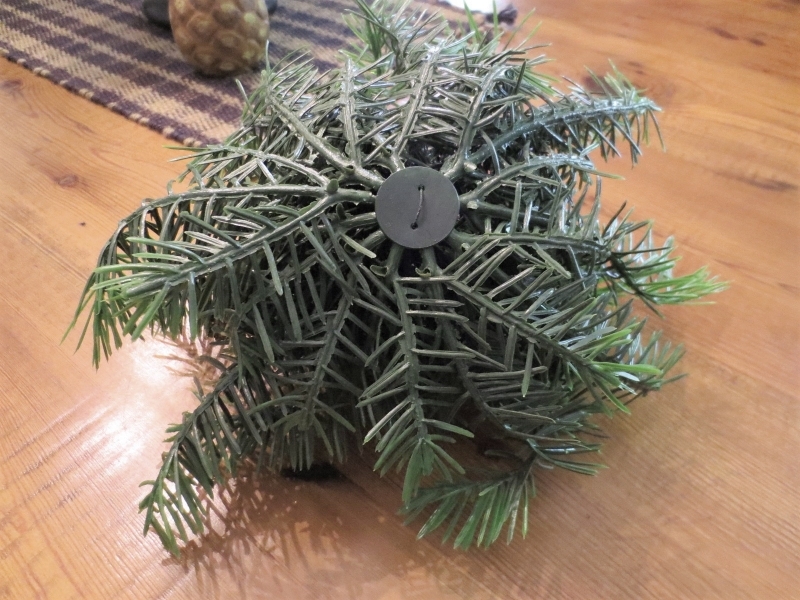 20'' tall with a 16' cord. Indoor use only. Imported. 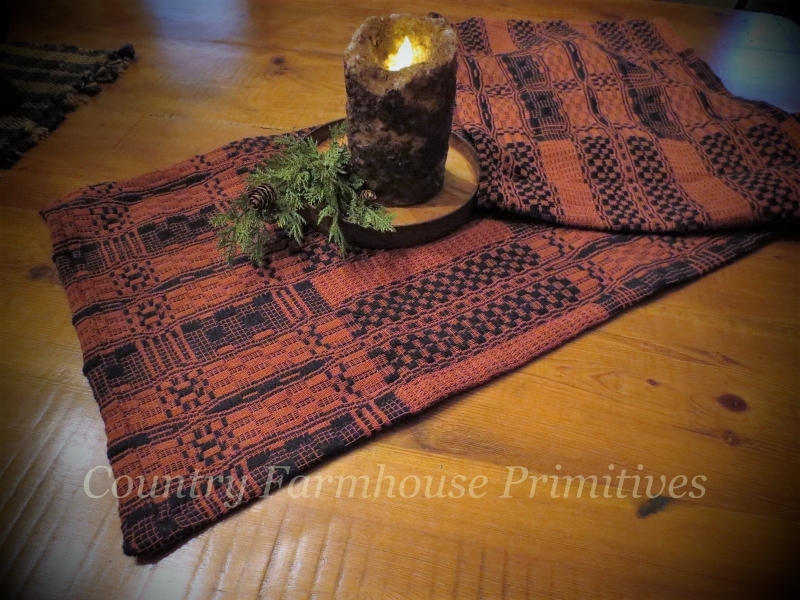 ​These have a wonderful look to them! A knit design in red, green & tan over a foam base. 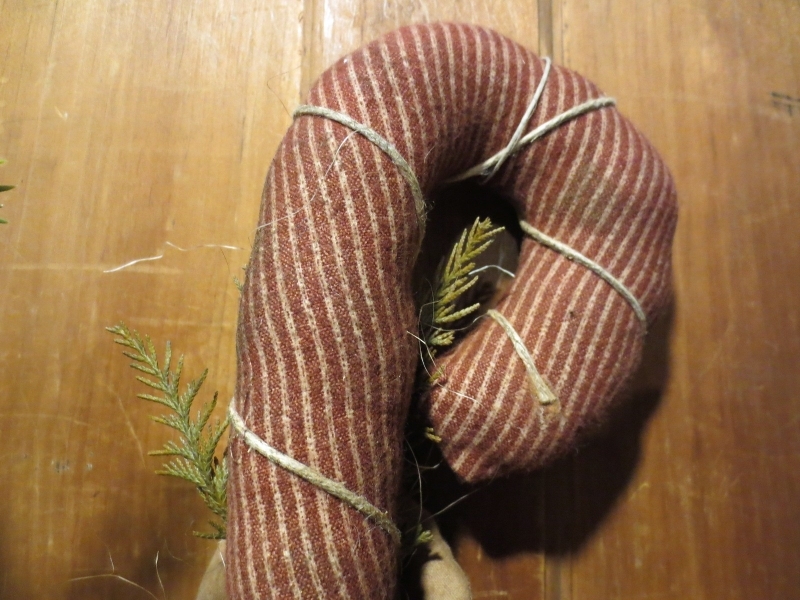 Jute hanger with wooden bead. Measures approx. 3.5'' - 4''. Imported. 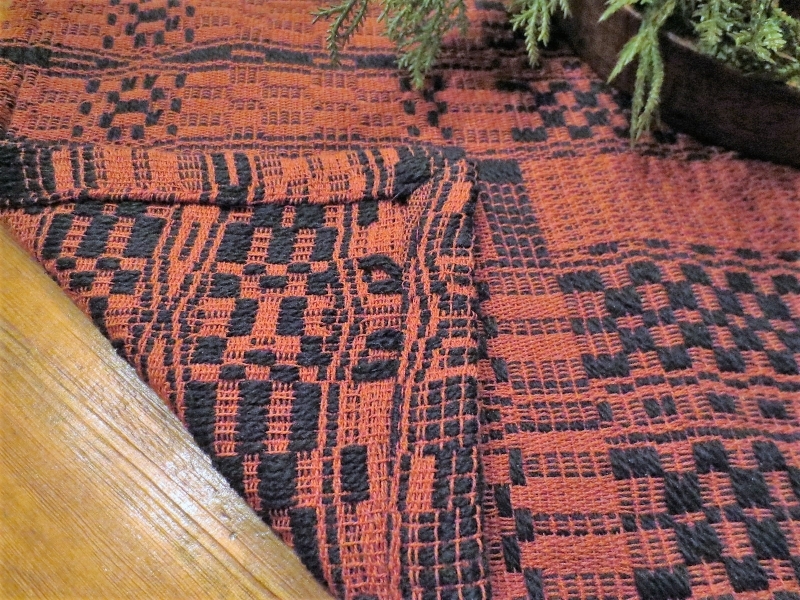 ​Great for the holidays, this woven runner measures approx. 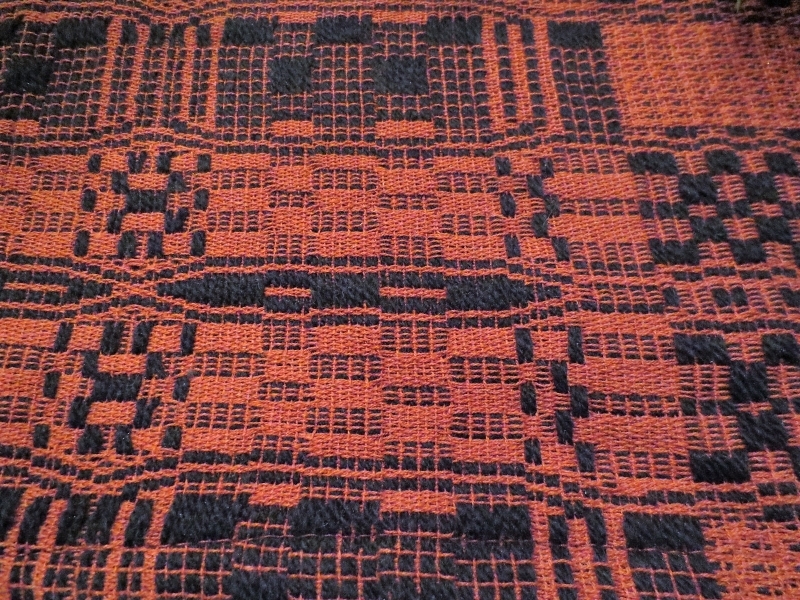 13''x54''. The manufacturer notes the colors as red/black, but to my eye the black looks more like a dark navy ... either way, very dark in color. Imported. 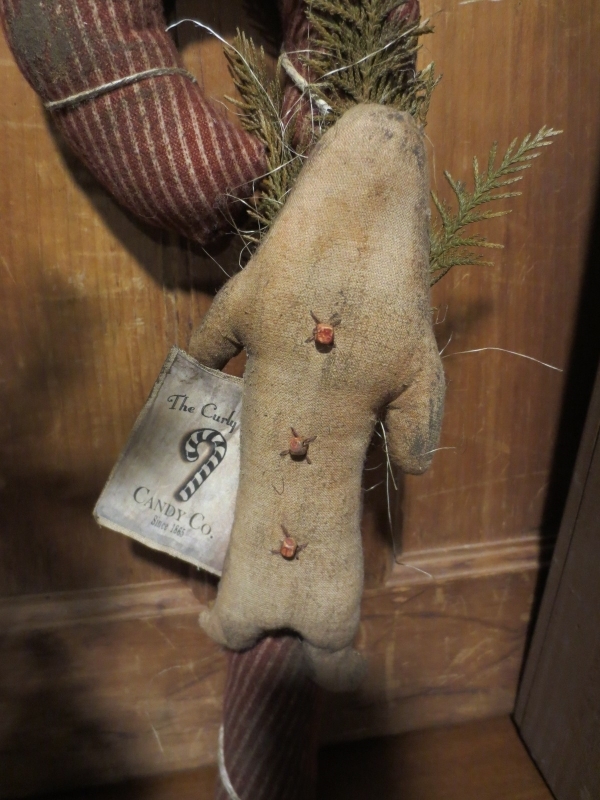 ​Made from an antique coverlet scrap, this sack of goodies includes a resin gingerman, greenery and a hang tag. Weighted bottom. 11'' t. x 6'' w.
​Blackened beeswax has been dusted with spices and topped with a piece of antique batting. Wire hanger ... ornament measures 6''. 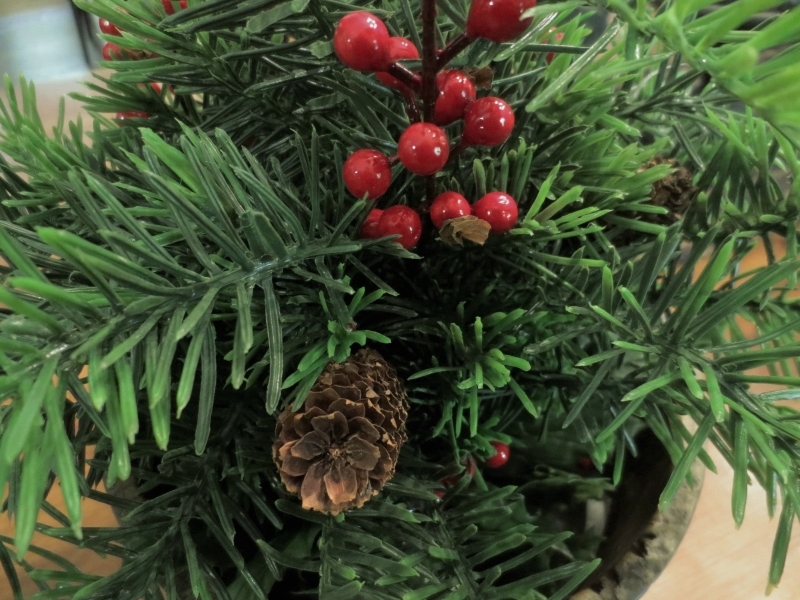 Lots of foliage and large berries on a 13'' stem ... Nice for filling buckets & baskets, plus they look great tucked into the branches of your Christmas Tree. 3 are shown in the bucket.